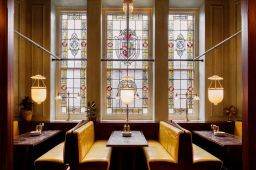 Dishoom Manchester is now open in the historic former Freemasons' Hall on Bridge Street. The space is – as ever – a loving homage to the old Irani cafés of Bombay and accommodates 231 covers between the two dining rooms and the Permit Room cocktail bar. The dining rooms are open every day from early until late serving Executive Chef Naved Nasir’s first-class menus of Bombay comfort food. The breakfast menu includes Dishoom’s famous Bacon Naan Roll and Sausage Naan Roll. This is followed by the all-day menu of small plates, grills, biryanis, salad plates, hand-made breads and sides. Dishoom is serving its signature House Black Daal and the Chef’s Special is a decadent Nalli Nihari Biryani. The Permit Room bar is serving Dishoom ‘Daru-walla’ Carl Brown’s lovingly curated list of cocktails.